What does one wear to meet the Pope? In FLOTUS' case, the answer is an icy blue Carolina Herrera sheath dress, which is what Michelle Obama wore to greet Pope Francis, Women's Wear Daily reports. The belted blue mock neck frock with a fit-and-flare silhouette exuded demure charm when paired with metallic kitten heels and Obama's signature smile. The much-publicized Washington, D.C. meeting occurred on Tuesday, where onlookers witnessed the festive occasion. Meeting Pope Francis occupies the same level of unachievable fantasy as meeting the Queen of England, and requires a similar amount of sartorial effort. After all, whose blessing is more sacred than the pope, aside from perhaps Anna Wintour? Yet somehow, the FLOTUS managed to communicate deference, elegance, and aesthetic allure in one single item of clothing. It seems Obama will receive fashion benediction after all. However, the Herrera frock Obama sported on Tuesday is far from the FLOTUS' first flirtation with the classic designer's wares. Numerous stately functions have seen Obama in full Herrera regalia, whether in the form of a crisp, fitted shift or a floor-grazing gown. As far as eveningwear designers go, Herrera tops the list in terms of timeless taste, favoring figure-enhancing silhouettes rendered in luxurious fabrics and jewel-toned hues. Read on for the FLOTUS' most dazzling Carolina Herrera moments. 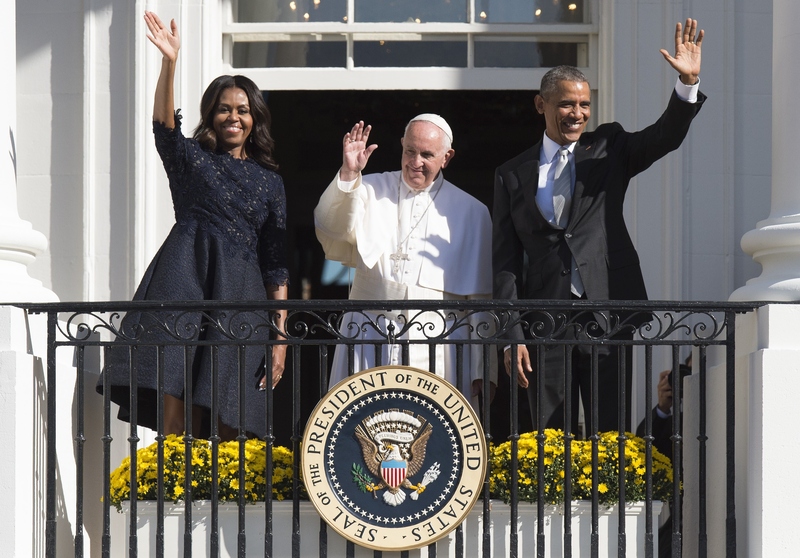 Pastel in hue and conservative in cut, Obama's Herrera frock was just the thing to win approval from the Pope. The FLOTUS greeted French president François Hollande in an utterly regal embellished silk and lace Herrera number in 2014. A scoop neck Herrera frock with curve-enhancing navy paneling added restrained charm to Obama's style. A square neckline with bow-embellished straps accented Obama's much-publicized arms, while the swirling pattern of the frock lent a whimsical air to the Herrera look. Herrera's boldly patterned silk flared frock with elbow-length sleeves found its match in the FLOTUS in January of 2015. Bold, beautiful blooms adorned Obama's jade-hued Herrera dress, which the FLOTUS sported on a trip to Cambodia in March of 2015.